Turkish President Tayyip Erdogan on Tuesday denounced the isolation of Qatar by neighboring states as a violation of Islamic values and akin to a "death penalty" imposed in a crisis that has reverberated across the Middle East and beyond. Erdogan's comments marked the strongest intervention yet by a powerful regional ally of Doha eight days after Saudi Arabia, the United Arab Emirates, Bahrain and Egypt cut ties with Qatar and applied stringent economic sanctions on it. Qatar denies accusations that it supports Islamist militants and Shi'ite Iran, arch regional foe of the Sunni Gulf Arab monarchies. "A very grave mistake is being made in Qatar; isolating a nation in all areas is inhumane and against Islamic values. 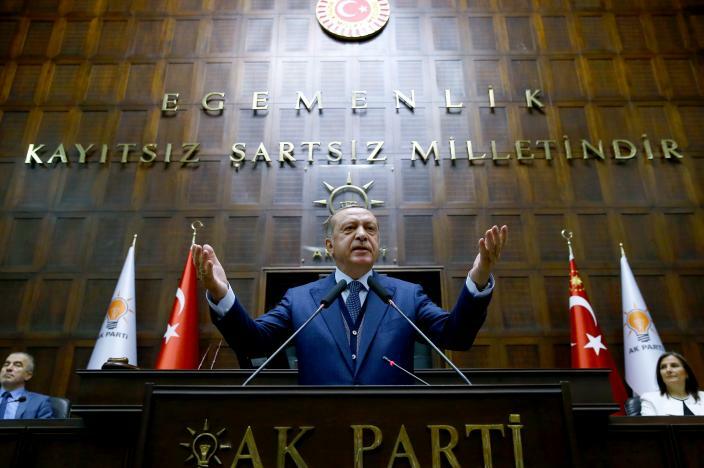 It's as if a death penalty decision has been taken for Qatar," Erdogan told members of his ruling AK Party in Ankara. "Qatar has shown the most decisive stance against the terrorist organization Islamic State alongside Turkey. Victimizing Qatar through smear campaigns serves no purpose." The UAE envoy, Yousef Al Otaiba, told reporters in Washington: "There is absolutely no military component to anything that we are doing." "I have spoken and seen (U.S. Defense Secretary) General (Jim) Mattis four times in the last week; we’ve given them our complete assurance that the steps we have taken will not affect in anyway Al Udeid base or any operations supporting or regarding the base," Otaiba said. The world's second largest helium producer, Qatar has also shut its two helium production plants because of the economic boycott, industry sources told Reuters on Tuesday. Turkey has maintained good relations with Qatar as well as several of its Gulf Arab neighbors. Turkey and Qatar have both provided support for the Muslim Brotherhood in Egypt and backed rebels fighting to overthrow Syrian President Bashar al-Assad. When asked what, if any, further steps would be taken against Qatar, the UAE's Otaiba said: "We’ve designated 59 people and 12 entities; it’s likely that you could see designations of their bank accounts, and perhaps of the banks themselves." "The specific list is being drawn up and the reason it has not been completed and passed on yet is because there’s four countries involved," he added. "Each country has their own set of lists, their own specifications and so we’re trying to compile and curate that into one master list and it should be handed over to the United States fairly soon." "Doha has become a financial, media and ideological hub for extremism. Then it must take decisive action to deal once and for all with its extremist problem," he wrote in an opinion piece for the Wall Street Journal published on Monday night. The minister, Adel al-Jubeir, defended the Arab powers' move against Qatar as a boycott, not a blockade, adding: "We have allowed the movement of families between the two countries ... so that we don’t divide families." There has been no breakthrough in Kuwaiti efforts to mediate in the crisis, but a U.S. official in the region said Kuwait was continuing with what is seen as a "slow, painstaking, deliberate" process focused inside the Gulf Cooperation Council. Qatari Foreign Minister Sheikh Abdulrahman al-Thani said on Monday that Doha "still had no clue" why Arab states had cut ties. He denied Doha supported groups like the Muslim Brotherhood that its neighbors oppose, or had warm ties with their enemy Iran. Turkey approved plans last week to deploy more troops to a military base it has established in Qatar under a 2014 agreement with the Gulf Arab state. The move was seen as support by regional power and NATO member Turkey to Doha. In Moscow, the Kremlin said President Vladimir Putin and Saudi Arabia's King Salman discussed the crisis in a phone call on Tuesday. The Kremlin said the dispute was not helping to unite efforts to try to find a Syria settlement or fight terrorism.